Chamonix snow history, including snow pack depths reported for high and low slopes through the most recent ski seasons. 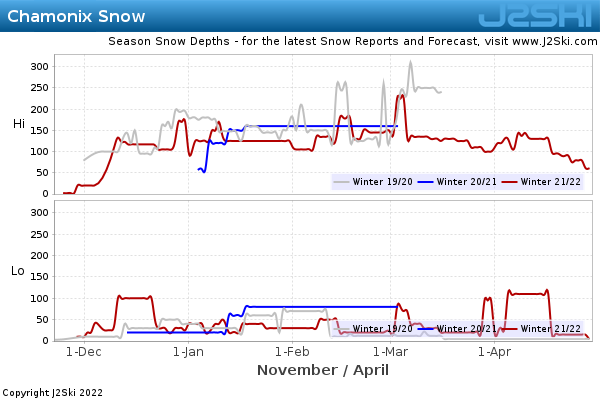 This chart shows the snow depth changes in Chamonix through the current ski season, compared to the previous winter. Snow reported by Chamonix so far in 2018/2019 has hit 350cm138in on Wednesday 12th December 2018. Snow reported by Chamonix in the 2017/2018 ski season reached 405cm159in on Friday 2nd February 2018. Note that snow history is not a predictor of future snow depths; it simply shows you how much snow accumulated in Chamonix that winter. Before skiing or snowboarding off-piste in Chamonix, you must assess the local snow conditions. Always check the local Avalanche Risk Level and ski with appropriate safety equipment. Past season snow depths for other popular Ski Areas near Chamonix. Note :- The Snow History for Chamonix, on J2Ski, is updated frequently and subject to significant change; snow depths and skiing conditions vary rapidly, as can all Mountain Weather Forecasts.